I love color! When I plan my outfits, I try to add some color because neutral colors seems boring to me. Sometimes I wear too many colors, which can be a problem! Haha! Besides my clothes, I love adding color through my accessories (handbags, shoes, scarves, hair accessories, etc...) and my new side hobby is nail art! 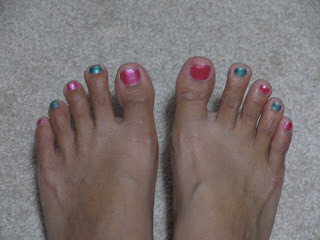 Growing up, my mom, my sister, and I would always keep our toenails painted. It was a fun girly thing to do in the family. 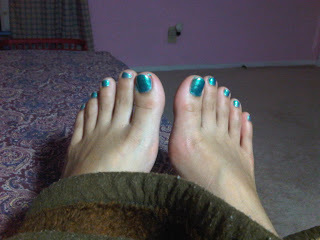 To this day, I cannot stand it when my toenails are bare. I need some color to keep them from looking for naked. I love buying nail polish! Although I love the expensive bottles ($4+), I tend to buy the cheap ones so I can have more colors for more variety. 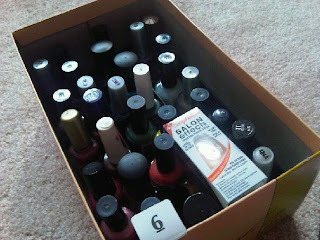 Plus, nail polish dries out really quick so there is no need to buy expensive brands. I am warning you that I have ugly feet so shield your eyes if necessary. I am not a fan of getting a manicure or pedicure. I have received manicures less than five times in my life and a pedicure just once. Never had acrylics before either because my nails are pretty strong and don't break/split. Sure the massage part is nice, but I hate the feeling of my nails being files and my cuticles are under control so I can never justify paying someone to do it. 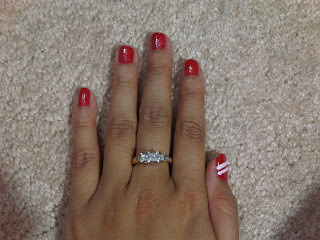 Doing it myself is just so much cheaper! Don't get me started on pedicures... those are way too easy to do! With the rise of YouTube and my cousin Nancy, I found that simple nail details can be done at home with tools such as band-aid, tape, toothpicks, and dull wooden pencils. I decided to attempt some simple designs just to see if I can do it. You see, my hands are not very steady and I was never careful with details. 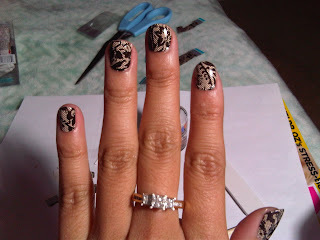 Heck, even painting my right hand is a difficult task! So right now, I'll just stick to simple dots and lines. 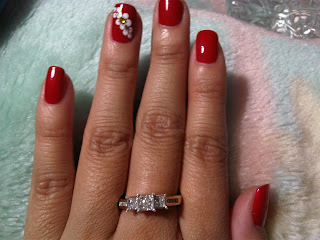 *I never planned on blogging about my nails so I don't have many pictures. Bet you noticed a lot of red... I like how red shows up in pictures and since it's my favorite color, I always choose red when I'm bored. I'll update with more colors later! 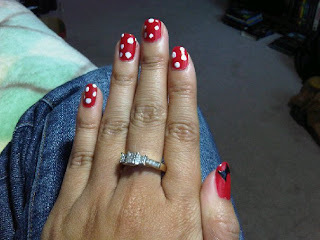 One day, I noticed my friend Katie, who always wears nail polish too, with the coolest nail designs! When I askd her about them, she told me they were these special nail polish stickers that are available at Sephora, but they are quite pricey. A few days later, while shopping with some friends at the Louis Vuitton Store inside Bloomingdale's at South Coast Plaza, my friend Amy and I notice our salesgirl's super cute nails cheetah print nails. 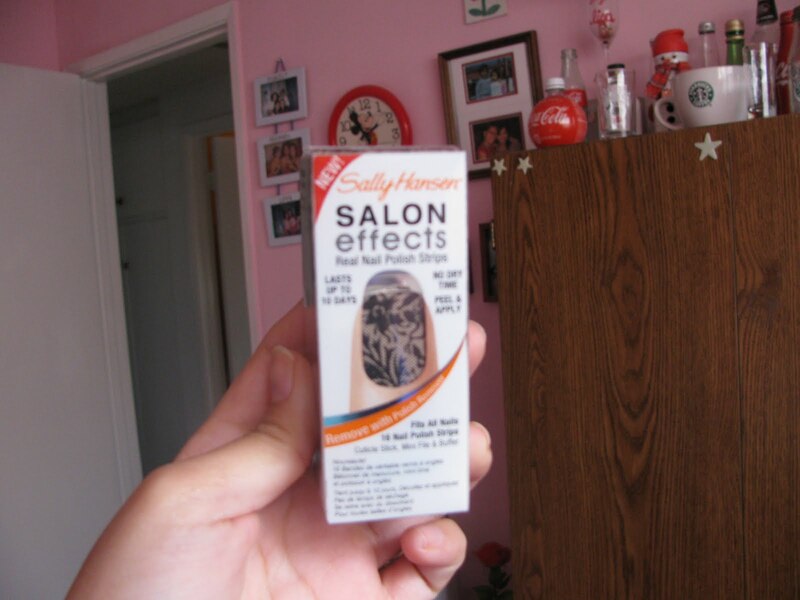 Turns out they were also the special nail polish stickers, but she bought some at CVS for a much lower cost! Super excitied, Amy and I ventured to many drugstores in search for these Sally Hansen Salon Effects nail polish stickers and found some at a local Walgreens, where we received a demonstration, samples, coupons, and a buy one, get one half off deal. Apparently these "nail designs" or "nail fashion" are the latest trend when it comes to nail art. (That and something called nail gels, but that's more along the lines of acrylics so I don't know much about it.) The first company to introduce this is Minx Nails and the designs offered through them are AMAZING! 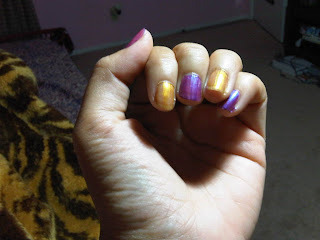 Let me know what you think of the latest nail trends!